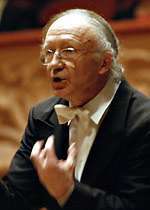 Holliger was born in Langenthal, Switzerland, and began his musical education at the conservatories of Bern and Basel. He studied composition with Sándor Veress and Pierre Boulez. Holliger took first prize for oboe in the International Competition in Geneva in 1959. In 1972 Holliger, Maurice Bourgue (oboe), Klaus Thunemann (bassoon), and Christiane Jaccottet (continuo) et al. recorded the Six Trio Sonatas for Oboe and Bassoon by Jan Dismas Zelenka. This recording is credited for the "Zelenka Renaissance". Katharina Jing An Gebauer (March 2008). "Heinz Holliger – Leben und Werk" (PDF (18MB)). BA (Composition) Thesis (in German). Retrieved 22 May 2008.